The WHO Regional Office for the Eastern Mediterranean (EMRO) has started to produce new MERS Situation Updates again after a hiatus over the winter, and has posted their April update. 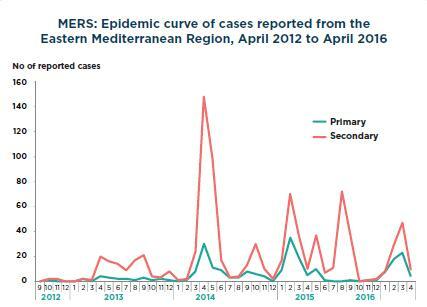 The accompanying infographic (see above) provides us with some detailed demographic data over the four years since MERS-CoV first emerged. As the graph above shows, while spikes have occurred during the late winter/spring of the last four years, there have also been significant outbreaks during the summer and fall months as well, primarily driven by nosocomial outbreaks. Bahrain reported its first case of Middle East respiratory syndrome coronavirus (MERS-CoV) on 10 April 2016. The case was fatal, a 61-year-old Saudi male who was admitted to a health facility in Bahrain for an unrelated medical condition. 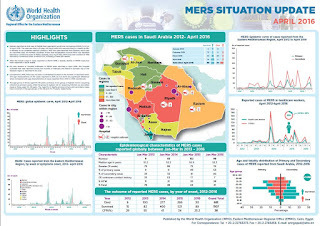 With this case reported from Bahrain, which was an imported case, all member countries of the Gulf Cooperation Council have now reported laboratory-confirmed cases of MERS. Globally, since April 2012, WHO has been notified of 1788 laboratory-confirmed cases of MERS-CoV, including at least 681 deaths. After the recent surge in cases reported in March 2016, a steady decline in MERS cases has been reported in Saudi Arabia. No new clusters or hospital outbreaks of MERS were reported in April 2016. The hospital outbreak that was reported during the months of February and March in Buridah city of the Qaseem region is reported to be over. Compared to 2015, there has not been a substantial increase in the number of reported cases. The age characteristics of the cases reported in 2016 do not show any significant difference when compared with age characteristics of cases reported from 2012 to 2015 (combined). The age group of those aged 50–59 years continues to be group at highest risk for acquiring infection as primary cases, while the group at highest risk for acquiring infection as secondary cases is those aged 30–39 years. The majority of deaths among primary and secondary cases have occurred in the age groups of 50–59 and 70–79 years, respectively.